Midwestern farm fertilizer runnoff is expected to create a massive algae bloom and a biological desert to follow it. The Gulf of Mexico teems with biodiversity and contains some of the globe’s most productive fisheries. Yet starting in the early 1970s, large swaths of the Gulf began to experience annual dead zones in the late summer and early fall. This year’s will likely be nearly a third larger than normal, about the size of Connecticut, according to a recent report from the Louisiana Universities Marine Consortium and Louisiana State University. This year’s dead zone will likely be nearly a third larger than normal. The problem is tied to industrial-scale meat production. To churn out huge amounts chicken, beef, and pork, the meat industry relies on corn as cheap feed. The US grows about a third of the globe’s corn, the great bulk of it in the Midwest, on land that drains into the Mississippi River. 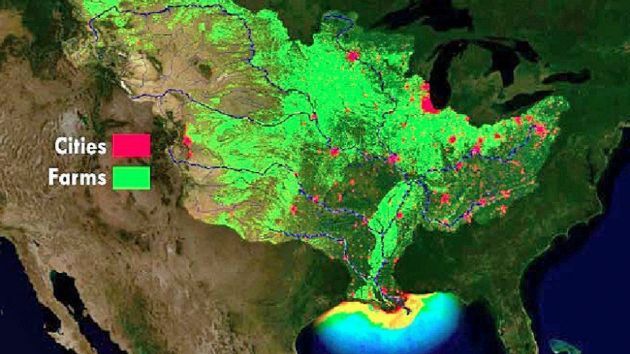 Every year, fertilizer runoff from Midwestern farms leaches into the Mississippi and makes its way to the Gulf of Mexico. ⇐ Welcome Oregon’s Constant Gardener!